We conclude a mini-series of upbeat songs about mental health with perhaps the most bizarre of all, a 1966 novelty hit song by the producer and singer songwriter Jerry Samuels, who also worked with, among others, Sammy Davis Jr. 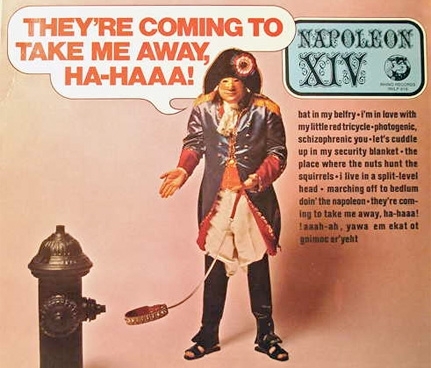 Starting with a marching beat, winding up into manic laughter and talking about men in white coats and funny farms isn't really the most politically correct way to talk about these issues, but this was 1966 and it's as much a comedy record as anything else, but the causes are timeless. The narrator seems to be addressing a partner who has left them, or possibly even a pet dog, and been driven into this state by emotional turmoil and loneliness. Arguably the song, like the titular leader in his later decline, could aptly be applied to current political leaders in different parts of the world, the decisions and announcements they make, and the media that surrounds and supports them.